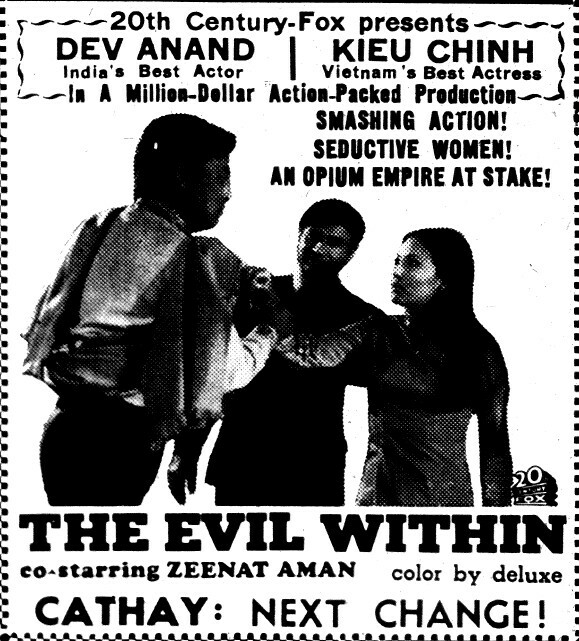 Dev Anand and Zeenat Aman acted in a Filipino movie, The Evil Within (1970), before Hare Rama Hare Krishna. It's probably not good, but I'm curious to see it. Always a weaker rival to Turner Classic Movies, the Fox Movie Channel more or less gave up on the competition earlier this year when it began showing contemporary movies with commercials in prime time. From early morning to mid-afternoon, however, FMC still shows the old stuff commercial-free, and if anything they've delved deeper into their library than before to broadcast obscure oddities. 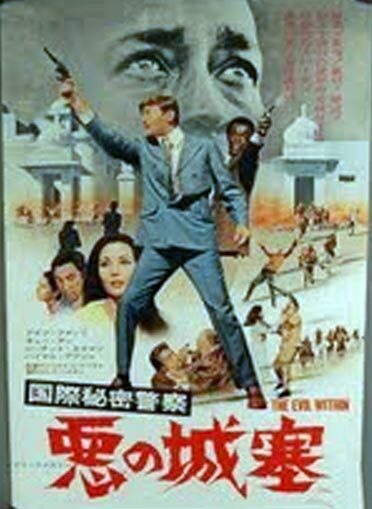 For example, here's a Filipino-directed crime melodrama shot in India and starring one of the subcontinent's biggest stars, the late Dev Anand, alongside future blaxploitation actor and S.W.A.T. star Rod Perry, who sings the picture's title song. Directed by Lamberto V. Avellana, The Evil Within's first reel promises more craziness than the picture ultimately delivers. We follow a stocky fellow known only as "The Fat Man" on a series of fatal rounds. Without preliminaries, we open with him stabbing someone. In short order he leaves a trail of bloody bodies in his wake. He may be an implausible fighter but he's a charismatic attacker, often screaming before he strikes. If he's the antagonist we may be on to something -- but eight minutes into the picture, he's shot in the back and killed in perfunctory manner by the minions of Hakim, a more ordinary figure who now settles into the primary villain role. The Fat Man was a Syndicate enforcer and his death signals a power play for control of the opium racket. That brings in Anand (playing "Dev") and Perry (playing "Rob"), the latter having survived a rare non-fatal encounter with the Fat Man during that brief, glorious rampage. One powerful clan runs the drug trade, buying the opium from the mountain tribes and shipping it out to the wider world. The clan is riven by family feuds, and for a while it looks like our heroes will play the Red Harvest game of playing criminals against each other. The crooks need little prodding in this direction, their rivalries ultimately complicated by a lesbian love triangle that leaves Dev himself in a shotgun-toting rage by the end of the show. It's hard to keep track of the villains in this one; just as Hakim abruptly eliminated the Fat Man, so he, too, is dispatched with little ceremony midway through the picture, after cajoling Dev's girlfriend of the moment into betraying him by promising her money so she can go to England. Without a strong core villain or a coherent menace of some kind it's hard to hold interest in this sort of story, and it doesn't help that Avellana brings very little energy to the action. In his defense, Fox Movie ran the movie "formatted to fit your screen," possibly subverting his compositions, but the story itself moves sluggishly. If this English-language picture was intended to put Anand over globally, it didn't work. 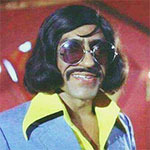 The actor was fluent in English, earning a college degree in English lit, but his delivery is blandly urbane, almost more philosophical than witty, and he was probably too old for his action-romance role by this time. This film is Perry's on-screen debut and he provides little more than -- excuse the expression -- color. His presence may have made the film more marketable during the Seventies, but IMDB doesn't indicate if the film was ever released in American theaters. One interesting aspect of his role is the throwaway acknowledgment that Rob is a Muslim; challenged to swear an oath on his presumed Christian faith, he tells a tribesman that he's of the faith that "looks to the desert." More colorful are the locations used, especially the luxurious fortress where the film's final act takes place, but Avellana never manages to make the action live up to the setting. All the materials are here for an exotic, eccentric spectacle, and it isn't hard to envision a Bollywood director, a blaxploitation specialist or any number of other Filipino filmmakers making more of it than this crew does. Still, the fact that The Evil Within played on American cable television is remarkable, and it reminds us that Fox Movie Channel is still worth watching -- or at least its schedule is, on the chance of discovering something as extraordinary as it is obscure.